The first chapter of this novel alone is worth every single moment of aguish that I experienced waiting for the follow up to Lamberson’s first novel in The Jake Helman Files – Personal Demons. The following 27 chapters (plus epilogue) sealed the deal, leaving me utterly satisfied and yet still jonesing for the next installment. Lamberson has really outdone himself this time around, solidifying Jake Helman as one of my all-time favorite characters in horror today. Seriously folks, cross genre fiction doesn’t get better than this. Like the previous book, it’s go – go – go from the start, blending equal parts frenetic comic book style, and seasoned police procedural thriller. Lamberson delivers the goods early on, setting up characters that play beautifully against Helman, while hurrying the story along in a quick and dirty way. The way that the author blends the back story in is also remarkable, as it doesn’t detract from the current read in the least. You’ll feel like you already know what went down in the first book, making this one just as good as a stand alone novel. It would be my suggestion that you read the first though, as it has some incredible scenes that you really shouldn’t miss. Now, I’ve mentioned before that Lamberson has a way with giving the invested reader a severe emotional beat-down of sorts. That is also very much the case with this book. In fact, there was a point where I had to put the book down for a moment – the scene was so shocking and came out of nowhere. Like I said in the Frenzy Way review, when you fall in love with a character in a Lamberson story – something bad is going to happen to them. I’m going to leave it at that. If you’re someone who loves Jake Helman, you’re going to be in for some serious surprises here – but man is it satisfying. The overall feel of the book is very much the same as the first. The only difference here is that Lamberson has really tweaked his story arcs, tightened up his dialogue, and really given his all to the development of every facet of the story. I wouldn’t be wrong to say that this is the best piece that Lamberson has presented to his reading audience. In fact, the only bad part of the book was the blank page following the end of the story. I walked away from this book completely satisfied and ready to take on Cosmic Forces upon it’s release in October 2011 – from Medallion Press. You can read more about The Jake Helman Files at the Medallion Press website and on Lamberson’s personal website. If you’re looking to contact Lamberson, check him out on Facebook, Twitter, and on LiveJournal. Also, it should be noted that Audible.com has purchased the rights to both Personal Demons and Desperate Souls for audio books. As a fan of that medium, I really couldn’t be more excited. 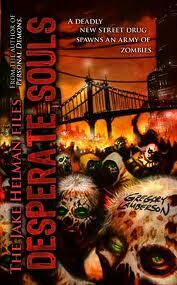 This entry was posted in Novels, Reviews and tagged Desperate Souls, Greg Lamberson by Mr. Dreadful. Bookmark the permalink.